I got that Vic a bard. Victors love bards. Fun fact: originally Frozio was here too, and the joke was about the crappy entertainment I got for his party, but the joke didn’t really work because hey, I would want a penguin magician at MY party. Being transported in cramped containers is a recurring theme in Cyril’s life. He’s used to it. Cyril’s just happy to be wanted. Sort of. And happy birthday Victor! Cyril is back!!! Happy birthday, Victor! I wouldn’t say he’s back. Don’t get too excited. 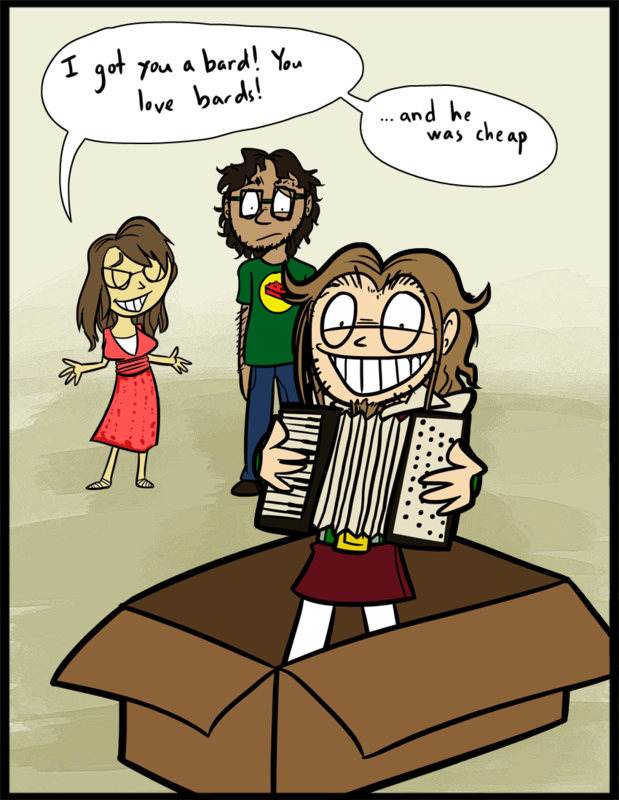 I do miss drawing the guy, but NOT his accordion. Well he never left my heart! So there! Wow, How much does it cost to ship a bard all the way from Ideaunu? A lot. Good thing the bard himself was practically free. Cyril looks SO happy just to be showing up again. Also, Cyril rocks. HI CYRIL. And OMIGOSH another meme reference! And Victor, at least he plays accordion! You can have an… accordion duet or whatever. Also, I’m assuming that’s courtney and Victor and saying “Hey, Courtney! You drew you and Victor! Victor doesn’t really have a shirt like that I improvised. But those are exactly the clothes I was wearing on Wednesday. Unlike some artists, I rarely draw myself, but Victor says that I drew myself “exactly 100% how I look” here, so if you see me on the street, say hi! Fun fact: we have four accordion players in our “marching” band now, and Victor is actually the leader. Wow Monocle, It’s a good thing you can’t hyperventilate in a comment. By the way, It’s my friend/neighbor’s birthday today as well! Happy Birthday! May you age but never grow up! this has been one of my happiest months ever you have had a stream of funny and amusing comics, a wild Cyril apeared and i got the third ending in cave story,thank you. Everyone you know is dead. Aww, I’m glad to hear it. And I’m glad Cyril has his fans, despite not being in the comic for very long. I love him dearly… he’s sort of an amalgamation of my band nerd friends who are some of my very favorite people. The hairiness and everything. Skarva, are you bothered by the fact that if you dont break the curse (or even if you do), that your son will most likely have five eyebrows? Also, if Lorelei is officially adopted as a Skarva (or recognized as the Fifth by the gods), could she also have 5 eyebrows? Well to be fair, in the comic you do look like a mother. I hope that’s not offensive. That’ll be awesome to see. I want a bard for my birthday! What is black, roundish, used a long time ago, and fires balls out of one end using gunpowder? … You… You stole my joke! *shakes his fist as lightning silhouettes him from behind* I WILL HAVE MY REVENGE! Phew, youre joking. Im just glad I noticed the afternote before I started putting up the barbed wire. Barriccades are easy to take down, but barbed wireee. ugh. Cyril: What inspired you to become a musician? What do you enjoy about music? Ecta: What was the last thing before the trip to fetch the lii flower that you recall making you happy? Veronika: What is your dearest hope? If I may be so bold, Posthumous do you remember how you became a zombie? He was killed by a cannon! “I… don’t talk about how I died. Now you’re not from Idenau so you may not know this, but that’s a very personal question for us dead people. Some people are very open about it and have no problem telling, but you’re not supposed to ask. I’m sorry, but I don’t like thinking about it anymore if I can help it. How I became a ZOMBIE, though? Well, I came to – it was dark and I was completely surrounded by something, pressing in on all sides, and I was terrified – and I expected my heart to start hammering away, but it didn’t… and then I realized it wasn’t beating at all, nor was I breathing, and it all came back to me, my death, and I realized what must be going on. I was a bit angry at the gods, but at the same time I thought I was being punished personally and I deserved it. The gods and their sick sense of humor, eheh, heh. It had been so peaceful, so happy, to be one with the world, but I barely remember it… it’s like a dream. wow Posti… that was beautiful. and sad, but so touching. truly a wonderful bit of writing. so much feeling. so much depth. so different from any other zombie story out there, an amazing turn of prospective. i- i love it. You’re probably gonna start losing readers pretty soon. Well, not me but maybe those other guys. If anyone stops reading because I have trouble updating in a timely manner sometimes, well, obviously they don’t care about the story and characters all that much, and me and Victor’s health and sanity are more important than their fickle preference. However, our readers, at least the ones who comment, have never been anything but understanding. I would like to know how Floyd came to work at Castle Skarva, though!